Final Opportunity to review Salem Grids prior to print. The page numbers are not accurate, but all other information we received via; online submission, fax, email, or phone has been included. If there is an error please email Meghan immediately or call 503-505-5865. Grid links: Independent Living, Assisted Living, Memory Care, Skilled Nursing & ICF, Home Health, and In-Home Care. Retirement Connection is not just an ad- we are an extension of your marketing department: Print, Web, Networking- we are here for you. Reach and out and let us know how better to serve your needs. Visit our new "About Us" page. 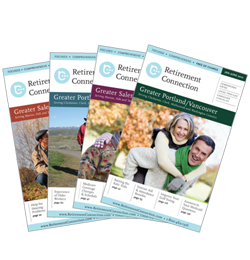 Please join us in celebrating the release of the newest issue of Salem Retirement Connection Guide and enjoy great wines, networking, and hors d'oeuvres. With over 200 guests expected this is a networking event you won't want to miss! This is an open event and all are welcome to attend so please feel free to invite your referral sources and other guests.